You know how it is, folks. 2019 is the year of the pig, so it was just a matter of time for crypto games to capitalize on it. Well, we were entering the final stretch of January when lo and behold, Etheremon announced two new Mons as part of their Lunar New Year event. They are the pig twins Pigperus and Piggicius, symbols of flourish and success, and of luck, respectively. Check out all the deets that have been released about these porky friends. First of all, we have the older twin—Pigperus. It is said that Pigperus brings wealth and victory to whoever has him, and since Gameunculus is all about that dough, he’s trying desperately to get one. How do you get one, by the way? The only way to catch a Pigperus is by buying eggs from the store. However, the game will be giving away 88 EMONT tokens to the first 888 egg purchases. Considering that each egg is worth 150 EMONT, then you are getting almost 2/3 of your EMONT back. Each account is entitled to only 8 of these EMONT gifts, though, so you can’t get EMONT like that forever. And then we have Piggicius, the younger twin. She’s the one who belongs to the lucky, and if you intend to get your hands on one, then luck is something that you will most definitely need. To get Piggicius, you’ll need to find her in adventure mode (where she’s replacing the departing Legendary Mons), or get her as a prize from spinning the Lucky Wheel. To spin the Lucky Wheel, you need 5 red envelopes—also known as Hongbao. Thankfully, you get a handful of Hongbaos from doing basic stuff, like logging in and playing adventures or ranked matches. Spinning the wheel can get you all sorts of gifts: Hongbao, EMONT, energy, level stones, mystery boxes and of course, Piggicius. Luckily, these piggies will be available from the 28th of January to the 11th of February (mind you, it starts and ends at 1:00 PM UTC), so there is plenty of time to get them. Excited for this event? 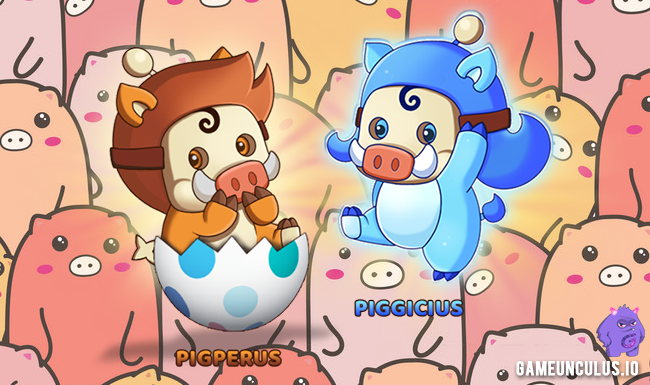 Which twin piggy do you like best? We want to know what you think! Have a chat with us on Twitter or Telegram!